The Wayne Junction train station is located in Germantown, Pa 19144. Old York Road to the east (beyond which lies Hunting Park). Wayne Junction station the southernmost part of Germantown, Pa 19144. The Philadelphia City Planning Commission (PCPC) defines Nicetown as a much smaller area bounded by Wingohocking Street, Broad Street, Hunting Park Avenue, and Clarissa Street; it defines Tioga as a smaller area bounded by Broad Street, Hunting Park Avenue, the railroads [exact western boundary unclear], and Allegheny Avenue. 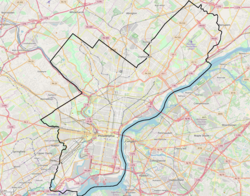 The 19140 ZIP code includes both Nicetown–Tioga and Hunting Park. Throughout the period between 1700 and 1850, the general Nicetown–Tioga area of Philadelphia county was rural, dotted with villages such as Nicetown. It contained farms that were a mixture of humble family farms as well as the country estates of gentleman farmers. Travelers on the Germantown road between Philadelphia (which was then only the area known today as Center City) and Germantown passed through the area. There were woods and swampy places. Like most of North Philadelphia, the Nicetown area experienced periods of explosive industrial growth during this era. The growth spurts waxed and waned with wars and recessions, respectively, as did its ethnic diversity: Irish-Catholics from the famine in Ireland, the Polish-Jewish refugees from eastern Europe after World War II, the influx in the 1960s of African Americans escaping poverty and legal discrimination of the south, and a surge of Puerto Rican relocation. All of these influxes were people of the blue collar and working class, which the neighborhood has always been home to, no matter which culture was largest at any particular time. The industrial culture of the area peaked during World War II, and declined immediately following the war. White flight began in the 1950s and hastened in the 1960s through the 1980s. Today[when?] there are a number of abandoned structures and a high crime rate in the neighborhood (hence today's North Philadelphia gallows-humor witticism that "there's nothing nice about Nicetown"). The huge population turnover of the 1960s overwhelmed the ability of the city to provide essential services to its constituents, including shortages of schooling facilities and housing. Deindustrialization in Nicetown led to joblessness and poverty. These factors degraded both public and personal life in Nicetown. Festive traditional events – like the annual Easter parade on Germantown Avenue, summer concerts at the Hunting Park bandstand and the opening of its wooden carousel, patriotic day parades from the American Legion, and the May Day celebration at Steele School – fell from popularity. The lively door-to-door street trade in the neighborhood vanished with the changeover from coal furnaces to gas; electric iceboxes no longer needing the iceman; milk, butter and eggs in abundance at supermarkets leading to the loss of the milkman. The continued change and impoverishment contributed to the flight of tradesmen and blue collar workers who sought work elsewhere. The assassination of Martin Luther King, Jr. set off riots that created fear throughout the neighborhood. Racial and economic changes took place and largely impoverished what was known as Nicetown, which suffered from urban decay in the face of suburban growth. Philadelphia, like other U.S. Rust Belt cities, slowly started its changeover from an industrial city to a postindustrial city. Nicetown–Tioga saw a brief spurt of urban gentrification in the early to mid-2000s. At the peak of the housing bubble in 2008, the 19140 ZIP code, which contains roughly Hunting Park and Nicetown–Tioga, had a median home sale price of $42,000. When the bubble burst, those prices declined significantly. In 2010, the average house there sold for $21,250, a 49% decrease in value. As of 2010, Nicetown–Tioga was 85.5% African American, 7.4% Hispanic, 2.9% white, 2.2% Asian, and 2% other. Though there's a predominantly black neighborhood, there is an increasingly significant number of Hispanics, particularly in the southeastern section near Hunting Park. Trump Entertainment Resorts in recent years planned to build a casino on a former Budd Company site on Hunting Park Avenue between Henry Avenue and Fox Street. This site is usually described as being in "Nicetown," although it is at the boundaries of Tioga, East Falls, and Allegheny West. The area between Henry and Wissahickon Avenues forms a line of industrial properties with the former Midvale Steel site (now a SEPTA bus depot), which is solidly in Nicetown–Tioga; hence the overlap in neighborhood identities. In May 2007, Tasty Baking Company (maker of the Tastykake brand, and long headquartered in Nicetown) announced that they would move production and office facilities to the former Philadelphia Navy Yard in South Philadelphia. Free Library of Philadelphia operates the Nicetown–Tioga Branch at 3720 North Broad Street. The Free Library of Philadelphia also runs a Hot Spot location in Nicetown, operating out of Mercy Neighborhood Ministries, the purpose of which is to increase computer access to residents. La Salle University's south campus expands into the northern section of Nicetown–Tioga section, also known as historic Belfield neighborhood. ^ Finkel 1995, p. 165. ^ USDA Forest Service webpage on American-Indian-language-derived names. Accessed 2007-12-06. ^ Tioga Pass Resort history webpage. Accessed 2007-12-06. ^ Finkel 1995, p. 170. ^ "Nicetown–Tioga Branch." Free Library of Philadelphia. Retrieved on November 7, 2008. ^ "Free Library Hot Spots". FLP. ^ Laughlin, Jason. "SEPTA approves natural gas power plant". philly.com.